Assume the number of radioactive nucleus is N(t) --- not yet decayed into daughter product. Each nucleus has the same probability p (p<1) decayed into daughter product. It means that dN(t)/dt= -p*N(t) , where dN(t) is the number of nucleus decayed into daughter product at time t.
The solution is N(t)=N0 e -pt = N0 e -(ln2/T0.5)) t where N(0) is total number of nucleus at time t.
Each box represent a nucleus. 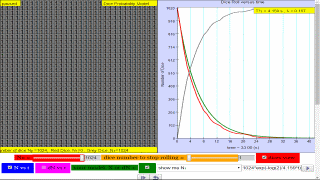 This applet let you set the probability for a nucleus to decay and watch how the number of decayed nuclei (color changed to RED) increased with time t.